SWHQ chats with resident DJ Yasmin from Rinse FM who’s putting together our monthly mix tape…music for you to shop along to! Hi Yasmin, thanks for joining us today. How would you best describe your very distinct sound and style? Soulful, slick and nostalgic. I try and keep up to date with the hottest new music and there’s a lot of current stuff I like, but I spend the majority of my time trying to discover forgotten gems. What is your favourite animal that does not exist? I’m a big cat kinda girl; lions, tigers, leopards etc but they all exist so I’ll go with unicorns. What is your favourite Sophia Webster shoe? I love her heels. 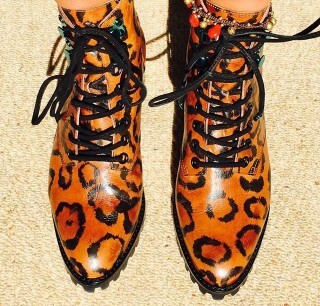 The Lacey is a classic but right now I’m obsessed with my Roxy leopard ankle boots! Definitely need to get myself a pair of the knee high versions, they’re next level..
You started Dj’ing from the age of 17? Was there a distinct moment which made you venture into the music industry? A friend of mine was a DJ and at age 17 I’d sneak into the club and hang in the DJ booth and loved being able to see everyone dancing and getting lost in the music. I’m also a bit of control freak by nature and like to set the tone, mood and atmosphere so I couldn’t resist selecting tracks from his collection. One day he was talking to someone and I got impatient with my requests so I just put the track on and managed to mix it in much to his surprise! What’s your favourite song to stomp to? My favourite songs change as often as the weather but as of today my stomping anthem would be Deep Cotton – Let’s Get Caught, new act signed to Janelle Monae’s Wonderland label, these guys are like R&B rockstars, bit of a Prince vibe. The video is epic. I’m curious to know what influences you, so tell me a little bit about how you stay inspired? And what do you draw inspiration from? I love to read, I get so much inspiration from books and articles, right now I’m reading Malcolm Gladwell ‘What The Dog Saw’ he writes these amazing profiles on people, epidemics, businesses, cultural movements etc and breaks down how or why they were successful or unsuccessful. He’s extremely descriptive and his subjects are always super interesting. I’m really blessed to get to travel a lot with my job and I get really charged up from visiting foreign places, meeting all different kinds of people. I also love to meditate and get my zen on, when I can shut off my mind and stay in a place of relative calm I find inspiration flows much more freely. If you could duet with any performer dead or alive, who would it be? You recently featured in ‘Barbie by Sophia Webster’ film and photo shoot with Kali Uchis, what was it like being involved? So I know you like 90’s hip-hop and R&B. What’s your favourite throwback track? If you could create the line-up for a festival, who would headline? I’d love to see Chaka Khan or Diana Ross headline a festival. Favourite moment in your career thus far? 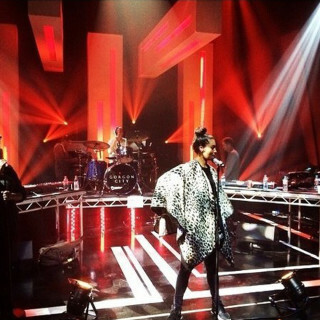 Being able to travel the world to provide music is my ongoing favourite but performing on Jools Holland was a big highlight for me.